RIDE RIGHT DOWNTOWN -- Between the buildings on Third Street, a 200-foot wake park is being built for the wakeboard and wake skate riders to perform their amazing tricks. Their incredible energy has drawn many to the annual Arizona National Boat Show & Watersports Expo, this year on Jan. 21-25 at the Phoenix Convention Center. Don't miss Rock The Boat's Chris Craft Scorpion next to the wakeboard display. Newly designed, never-before-seen stunt rails have been built for this year�s show and will allow wakeboard and wake skate riders to showcase tricks that have been impossible to perform in a wake park, until now. 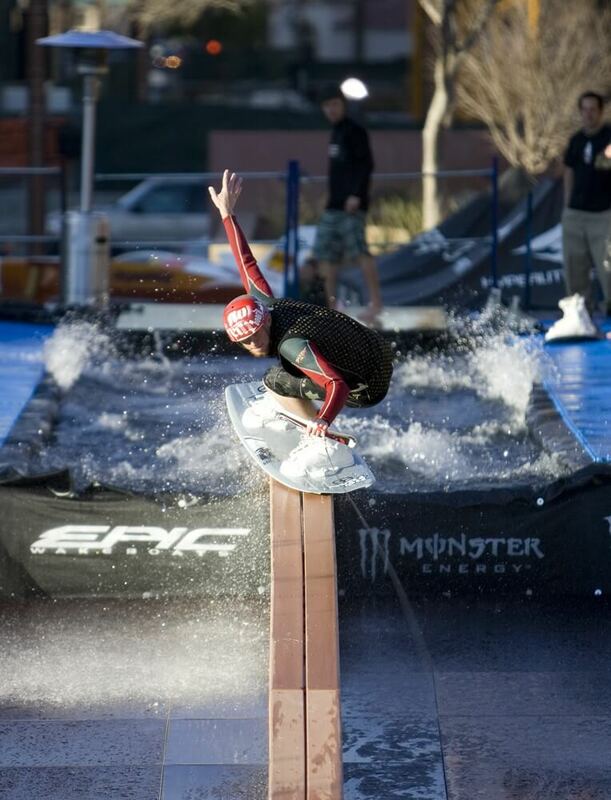 The 200-foot wake park being constructed between the buildings of 3rd Street will give water enthusiasts the chance to see their favorite professionals show off the latest tricks, flips, and stunts off the lake. Get ready for the 2009 boating season by attending the 38th Arizona National Boat Show & Watersports Expo going on Jan. 21-25 at the Phoenix Convention Center. The Arizona National Boat Show offers more for boaters than any other show of its kind. �This is the No. 1 boat-selling event of the year and the wakeboarding industry is bigger than ever,� says MasterCraft Boat dealer Debbie Hayes. Attending the show will allow attendees to get a sneak peak of the new 2009 boats, cruisers, bass boats, fishing boats and houseboats, as well as shop rows of the hottest marine accessories. The 38th Arizona National Boat Show & Watersports Expo will take place at the Phoenix Convention Center Wednesday, Jan. 21, 3-9 p.m.; Thursday and Friday, Jan. 22 and 23, noon-9 p.m.; Saturday, Jan. 24, 11 a.m.-9 p.m., and Sunday, Jan. 25, 11 a.m.-6 p.m. Admission is $8 for adults, $7 for seniors, and kids 12 and under are free. Discount tickets can be found at www.arizonaboatshow.com www.arizonaboatshow.com . For more information, please call (800) 657-3050.